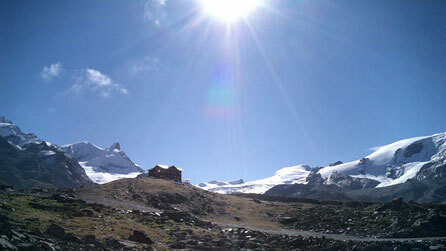 The mountains surrounding Zermatt are dotted with huts and cabins of various levels of comfort. Showers represent a pinnacle of luxury; in others a litre of hot water can be bought for washing purposes. Accommodation is in private rooms or dormitories depending on the capacity of each hut. But for those who love or who wish to know the Zermatt Alps better overnighting in a mountain hut raises the level of intimacy between man and nature to a new plane. My favourite huts provide excellent three-course dinners, a good wine list, hearty breakfasts as well as unparalleled sunsets and sunrises. Mid tour we dart down to Zermatt for a night on a feather pillow, fresh clean sheets, a hot shower and a change of socks before returning to the crystal clear air of the high Alps.